Walk by this old cigarette factory, and you can’t help but feel like you’re being watched. 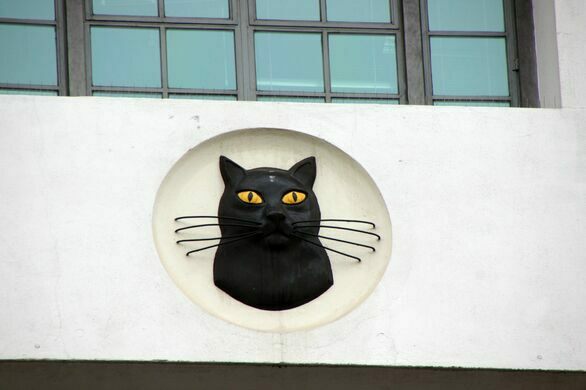 The faces of black cats line the wall, their yellow eyes constantly staring at the street. 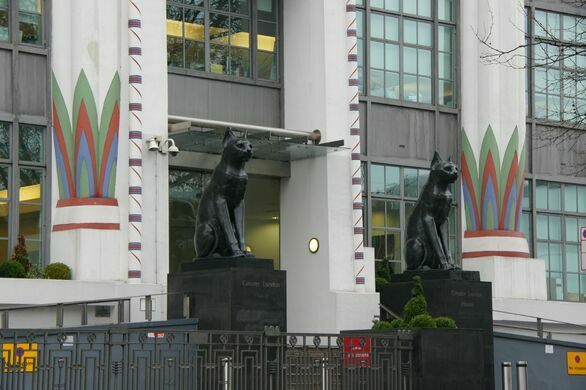 Two enormous cat statues man the door like feline guards ready to inspect anyone who attempts to enter. The Carreras Tobacco Company got its start in the 19th century as a small shop known for the local cat who frequently enjoyed napping in its window. 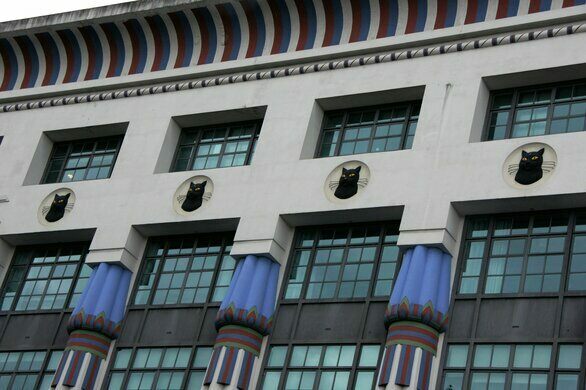 The company adopted a black cat as its logo, and kept this nod to its humble roots even after its grand Egyptian revival-style factory was unveiled in the 1920s. At the time people around the world were captivated by stories of ancient Egypt, thanks to the discovery of Tutankhamun’s tomb. 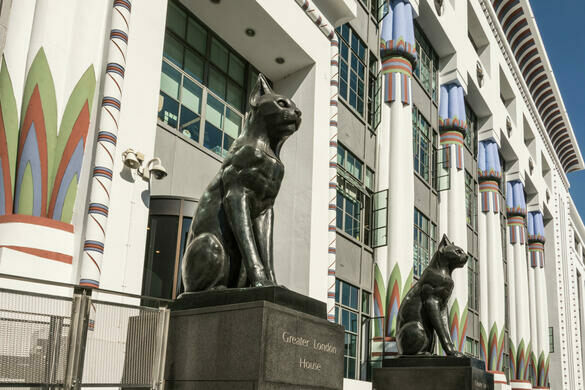 Vibrant Egyptian-style columns were erected outside the building’s exterior and two regal cat effigies meant to symbolize the goddess Bastet guarded its entrance. Based on its original plans, the building was meant to take the shape of a temple to the goddess. Even the factory’s grand opening was packed with Egyptian revival extravagance. Sand was dumped on the pavement outside to make onlookers feel as though they’d been swept away to the desert. Performance from the opera Aida paraded around the building and other actors donned themed garb to set the mood. A chariot race was even staged nearby. 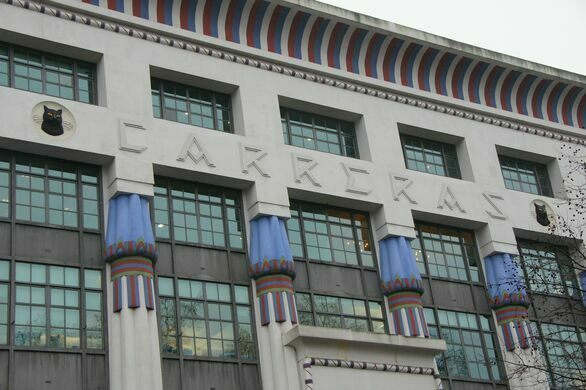 But the factory’s Egyptian flair didn’t last for long. In the early 1960s, the building was converted into office spaces. Its signature decor was stripped away, and the two iconic cats that once sat outside the door were shipped off and separated. It wasn’t until 1996, when the building came under new ownership, that its former grandeur was restored. Now, the columns are once again vivid, black cats peer down from the wall, and replicas of the original effigies sit stoically near the door. 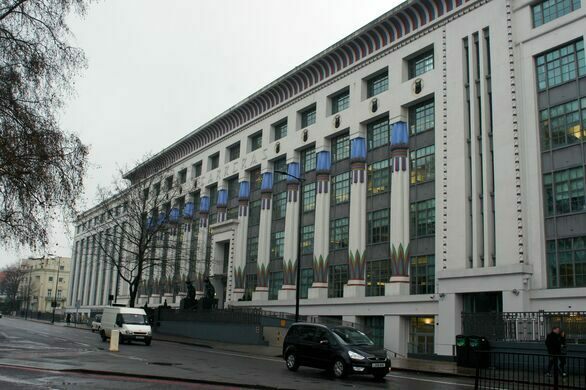 The former factory is now the Greater London House office building. 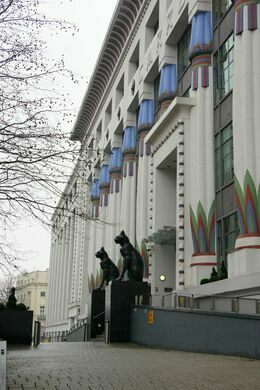 The replica cats can be seen out front. 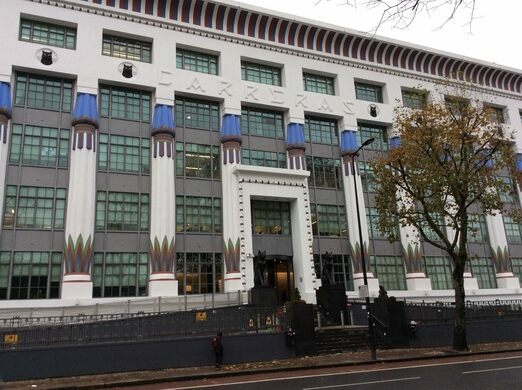 It's worth noting that the building, controversially, filled what had been a public green, Mornington Crescent, which is the reason for the building's odd crescent-shaped rear. 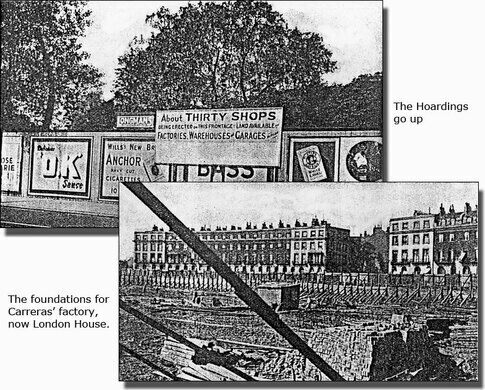 This led to a successful campaign to preserve London's remaining open spaces. The nearby tube station is named for the vanished park. This collection of illusory paraphernalia has been culled from the history of London's premier magician's club.